Over 20 million Americans lack the ID they need to live full lives. At Spread The Vote / Project ID, we help members of our communities obtain the IDs they need for jobs, housing, health care, and, most importantly, identity. Spread The Vote /ProjectID believes that well-supported and well-informed voters are frequent voters. IDs, election guides, and voting plans educate and empower voters, closing the gap between registered voters and voter turnout. Spread The Vote is expanding to take the tools that we’re building to get the 77% of our clients who have never voted to the polls to a larger audience. We’ll use macro and micro strategies, from the digital to the personal, to educate voters 365 a year. Project ID will get IDs for EVERYONE. Whether you can vote or not, we’ll help you get the ID you need to change your life. If you are eligible to vote, we’ll keep doing what we do- make sure you’re registered, walk you through our custom election guides in person or at a community event, and get you to the polls. If you can’t vote YET, but will turn 18 or have your rights restored or be otherwise eligible at a later date, we’ll be there to get you to the polls when you can. With these two brands working together, Project ID and Spread The Vote will help anyone who needs an ID get one, bring new voters to the polls across the country, and prepare future voters to make their voices heard as soon as they’re eligible. We are working on these new ways to change American lives and American elections. 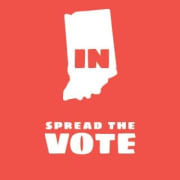 Would you recommend Spread The Vote Indiana?